COMOX VALLEY, BC- The Comox Valley RCMP are still looking for Stephen Mapes. Mapes was reported missing to the Surrey RCMP on April 2nd of this year. The investigation was handed over to Comox Valley RCMP earlier this month. Both his family and police are concerned for his well-being, as this is out of character for him to be gone for this long. He was last seen in Courtenay on March 27th. 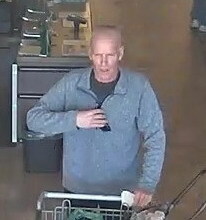 Police have also released security footage of Mapes from Nanaimo, which was recorded before March 27th. Stephen is described as: white, six feet tall, slim build, with short grey hair and blue eyes. If you see Mapes or know where he is, contact police or Crime Stoppers.